When there are no stars in the sky, sometimes all you need is a ladder, a friend, a dog, a cat and an all-night hardware store. 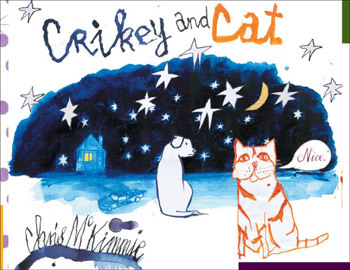 A story celebrating creativity and friendship from the highly acclaimed author and illustrator Chris McKimmie. Chris McKimmie is a writer, illustrator, artist. His previous books with Allen and Unwin are Brian Banana Duck Sunshine Yellow (2006), shortlisted for the 2007 CBCA Awards, Maisie Moo and Invisible Lucy (2007), Special Kev (2008), shortlisted for the 2009 CBCA Awards, Two Peas in a Pod (2010), shortlisted for the 2011 CBCA Awards, Good Morning, Mr Pancakes (2011), Alex and the Watermelon Boat (2012) and Scarlett and the Scratchy Moon (2013). Chris also wrote, illustrated and designed a series of eight books in the late seventies. He has worked as a lecturer, a graphic designer, a film production designer, a cleaner, a dad, a pot-plant painter, a public servant, a musician, a factory hand and a grand dad. He regularly exhibits his paintings and drawings.